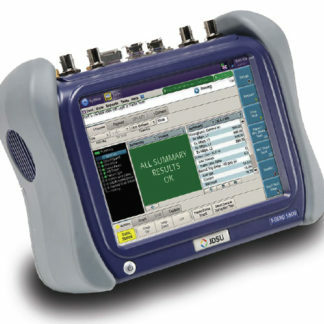 The MTS-5800 Handheld Network Tester is designed to address the challenges of the Carrier Ethernet evolution. It supports both legacy and emerging technologies required to handle various network applications including Metro/Core, Mobile Backhaul, and Business Services installations. The industry’s smallest 10G handheld instrument supports testing throughout the entire service life cycle including installation, troubleshooting, and maintenance. The MTS-5800 ensures successful mobile backhaul transitions by validating new Ethernet synchronization deployments (1588v2 and SyncE) that guarantee successful mobile handoff between cell sites, thereby avoiding service degradation.